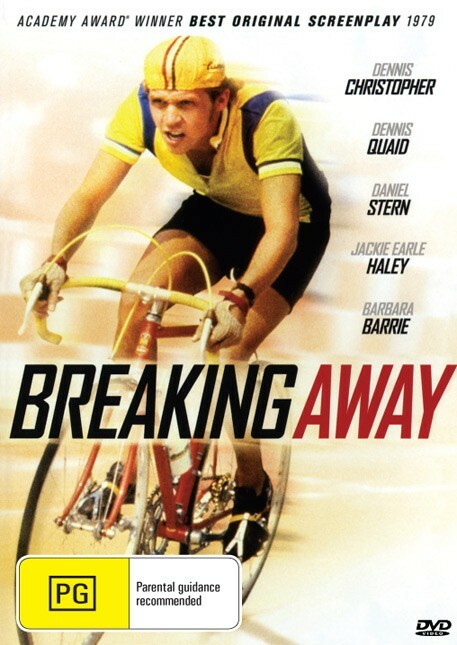 Ten questions on the uplifting film "Breaking Away". The cycling movie that says when you're young you're bound to have dreams, and sometimes chase them. 1. In what U.S. state is Breaking Away set? 2. Dave is the main character in Breaking Away. What is his last name? 3. In Breaking Away, what nationality would Dave love to be, so much so he renames himself? 4. What derogatory name do the college students have for the town's inhabitants? 5. Dave falls for a college girl and gives her what name? 6. What job does Dave's father have in the town? 7. When Dave competes against the international cycling team, how do they sabotage him? 8. What surprise do Dave's parents spring on him? 9. When Dave exasperates his parents, what does his mother say she'll do? 10. When Dave's team wins the Little 500 race, what color shirts are they wearing?